Over the years, studies have shown that lab coats and scrubs are a significant source of microbe growth within the healthcare industry. Antimicrobial scrub technology offers an added benefit for those working in the medical field who are required to wear scrubs and lab coats. Antimicrobial fabrics feature a protection technology that inhibits the growth of bacteria while minimizing odors and stains to prolong the life of the garment. In previous years, antimicrobial technology was expensive to buy, and the scrubs using this technology came in limited, boring styles. But now, Scrub Hub is proud to offer affordable and fashionable antimicrobial scrubs and lab coats to medical professionals. Antimicrobial scrubs are built to last and withstand the rigorous work of being in the medical field 12+ hours a day. They repel odors, buildup, and stains to extend the life of your uniform. Antimicrobial technology repels unwanted bacteria from your scrubs by incorporating bacteria destroying substances in the fabric. This gives you peace of mind at work and at home, knowing that you are not spreading harmful germs. Not only are you protected from germs, but you will save money because these scrubs last longer. Antimicrobial scrubs offer high-quality protection while also providing you with the latest fashion and trends. They come in a variety of styles and colors. Scrub Hub carries styles for men and women. Check out our new selection of brands, including Code Happy and Infinity by Cherokee, with the latest in antimicrobial technology. Browse our online selection of antimicrobial scrub tops, scrub pants, scrub jackets, and so much more! 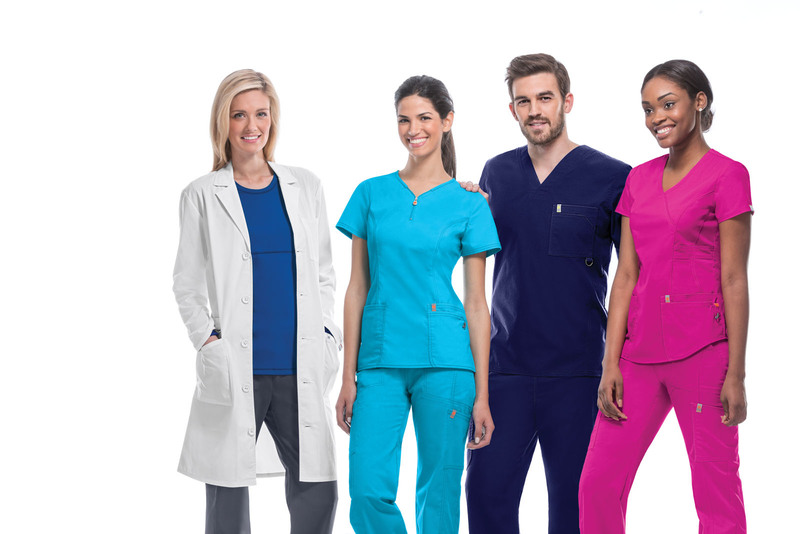 Scrub Hub is proud to offer an incredible selection of brands with antimicrobial protection plus fluid barrier technologies including Cherokee Infinity, Heartsoul, Dickies, Cherokee Workwear, and many more! We also provide other medical accessories such as shoes, stethoscopes, support hose/socks and much more. Browse our online selection of antimicrobial scrubs and lab coats here or contact one of our 5 area locations today.